A bright, beautiful smile can be yours, thanks to the talented professionals at 7 Day Dental, the best cosmetic dentistry provider in Orange County. Your smile is one of your most important attributes, leaving a great impression with those you meet. And improving your smile will boost your confidence. If you have stained or missing teeth, a crooked smile, or a chipped tooth, our cosmetic dentists can provide the solution. Most cosmetic treatments are quick, painless and surprisingly affordable. Teeth whitening is a simple, non-invasive dental treatment used to change the color of natural tooth enamel and is an ideal way to enhance the beauty of your smile. There are many causes of tooth discoloration, including staining from foods, tobacco, aging, genetic factors, and certain medications. Whatever the cause, one of the several whitening methods will fit your lifestyle and budget. For best results, we offer whitening services in our offices. Philips Zoom WhiteSpeed allows you to have whiter teeth in just 45 minutes and is capable of whitening teeth up to eight shades lighter. We also have products you can use at home daily for several weeks that will noticeably whiten your teeth. The maximum effect is achieved with customized trays that are made to fit over your teeth. For those who want a simpler and less expensive home treatment, we offer Sheer White! whitening strips, whose active ingredient, carbamide peroxide, is more stable and less sensitizing than those of some other products. Matched to the color of your teeth, durable porcelain is used for crown, bridges, partial dentures, inlays, onlays and veneers on the front teeth. Our expertise in custom-fitting these strong, functional restorations is key to making us among the best cosmetic dentistry providers in Orange County. Inlays and onlays are used to restore the lost surface area of a rear tooth where the damage is a bit too much for a filling, but not enough for a crown. These are made of strong, tooth-colored porcelain or composite resin. Inlays are recommended in place of silver amalgam fillings, because they provide better protection. Inlays do not expand or contract and they are securely bonded to the teeth. Onlays replace the missing biting surface and fit over the cusps of the teeth. They are used for teeth that have more damage than a filling or inlay can compensate for, but not damaged enough to require a crown. Composite resin is bonded to teeth to enhance the appearance of teeth that are stained, cracked, chipped, and even to fill gaps between your teeth. Composite resin is not as strong or stain resistant as dental porcelain, but it is less expensive. It may be a good choice for small fillings and restorations that are not on biting surfaces. Veneers are used to improve the appearance of the front surface of the teeth. They are made of thin, custom-made porcelain shells that are resistant to staining and very durable. Preparation for the veneer involves removing a small portion of the enamel. Lumineers are special highly translucent, ultra-thin veneers. Their placement requires little or no tooth reduction. Both standard veneers and lumineers are very strong – with proper dental care they can last up to 20 years. An implant with an attached crown is the best way to replace a missing tooth. It will prevent further loss of bone and prevent your other teeth from moving out of proper alignment. An implant includes a titanium post that is implanted in the jaw, an abutment and a crown. To avoid problems, you should get an implants to replace missing teeth as soon as possible. 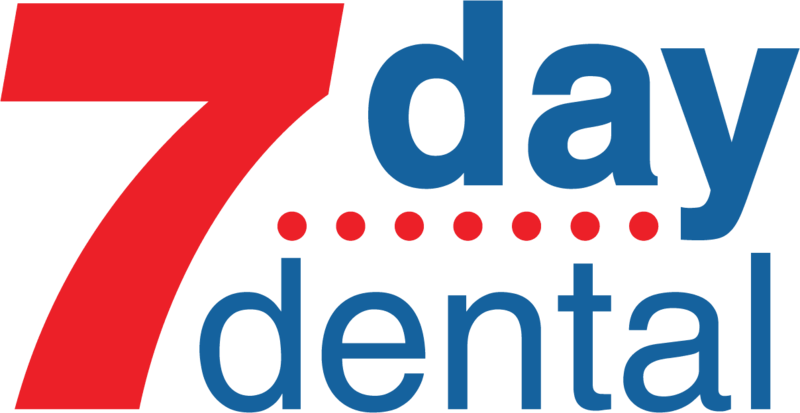 When you want the best cosmetic dentistry in Orange County, come to 7 Day Dental. Our comfortable, multi-specialty offices and expansive hours are designed for your comfort and convenience. best products to create your lovely, natural-looking smile.